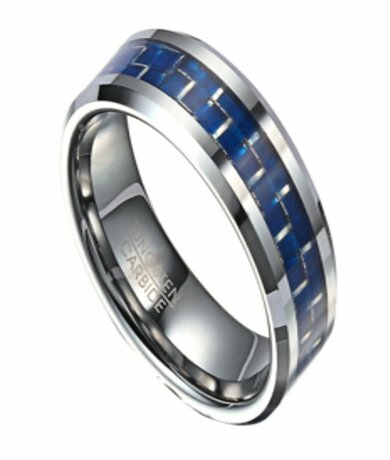 A hint of cool color makes for an eye-catching tungsten ring for men. Handsome blue carbon fiber inlay is bordered by satin finish lines and gleaming polished beveled edges. 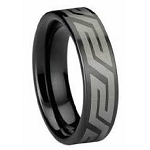 With its flat profile and 8mm comfort fit band, this men's carbon fiber tungsten ring is as easy to wear as it is attractive. Comfort fit tungsten rings usually run 1/2 size larger, it is suggested you buy a half size smaller than your standard ring size. We recommend having your finger measured for a comfort fit ring at your local jewelry store for an accurate fit. All of our tungsten rings come with a lifetime warranty. 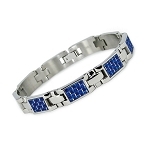 Click image to check out the matching bracelet to complete this look!